Today I got to visit my best friend Tara and her new horse Jack. I should probably tell you the back story to Tara and my friendship. We met in a combination class in elementary school. I believe I was in 3rd grade and her in 4th grade, but I can’t be sure, it was so long ago. I apparently approached her and struck up a conversation, this is extremely rare for me but luckily I did because we have been friends ever since. It’s been 15 years! So anyway we bonded over our mutual love of horses. Okay to be fair all little girls love horses when they are that age, however, we never seemed to grow out of it. 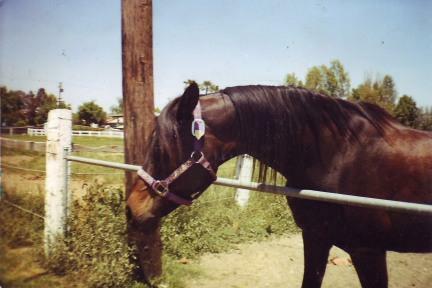 Eventually Tara bought a horse of her own, Kricket, a beautiful dark bay Arabian mare who we adored. We visited her all the time and spent hours down at the ranch riding and caring for her. Eventually Kricket was sold but the bond that she created between Tara and I has remained constant. It’s been years since Tara had a horse but luckily for her she found a really great NSH gelding that she purchased about a month ago. I had been trying to see Jack since she bought him but every time I tried to visit him something would come up; high winds, fire, scheduling conflicts, etc. Finally today I got to see him in person. He is a gorgeous boy; standing about 16 hands tall and full of personality. 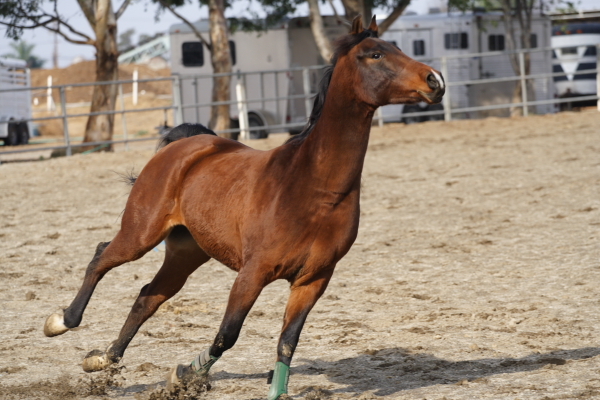 Tara let him out in the arena so he could show off for me. He worked himself up into quite a sweat with all the running around he did. He somehow managed to even pull off one of his shoes! After his workout he got in a few minutes on the hotwalker to cool down then we proceeded to groom him. As Tara and I brushed out his fur it felt like old times again. It’s nice to know that after all these years we are still bonded by our love of horses. 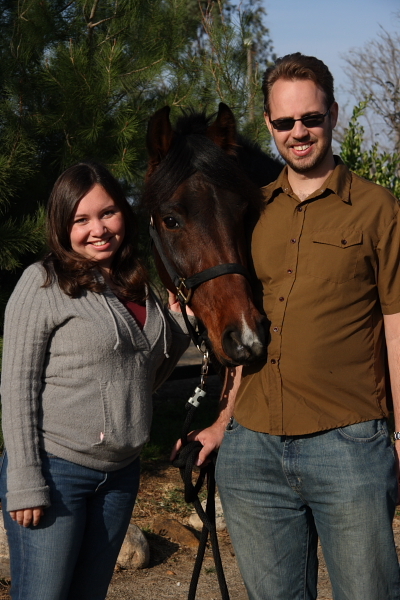 Before Bryan and I left we posed for some pictures with Jack, we hope to see him and Tara again real soon.